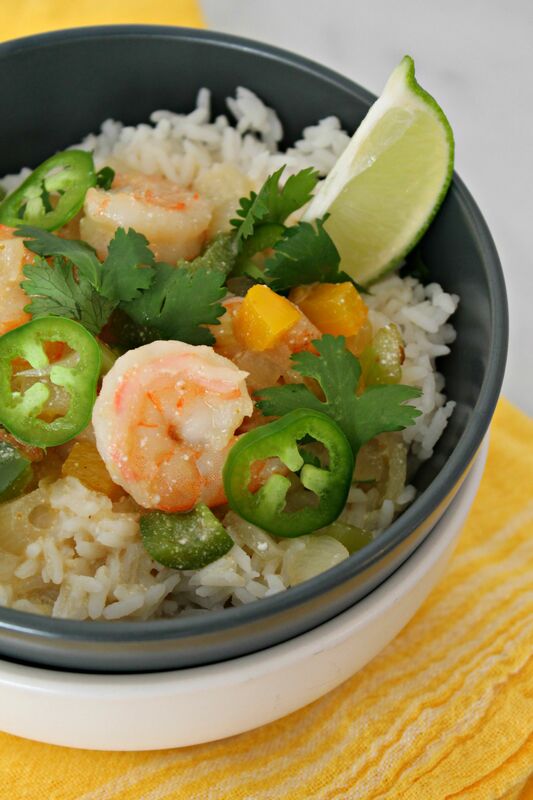 Wrap your hands around a warm bowl of this Thai Shrimp Soup and you’ll actually be excited about the cooler weather – the curry flavors go in perfect combination with the blank canvas of steamed rice and a squeeze of fresh lime juice. One of my favorite things about the cooler temperatures is that the cooking at home honestly gets easier. Why, you ask? Well, my husband and I are huge fans of soups during the fall and winter and can sustain with just that! So when I tested some recipes for a quick Thai Shrimp Soup, making pot after pot of it, we were two happy campers. Not only did this soupy sate fantastic the first day, but it froze beautifully and when reheated on the stove top, tasted even better once the flavors concentrated. Head over to American Kitchen and check out the full recipe there! This is the third recipe I’ve created using American Kitchen pots and pans, be sure to check out the others including Caprese Chicken Dinner and Champagne & Asparagus Risotto. Also, stay tuned because I’ll be hosting a giveaway of some of my favorite pans from the brand before the year ends – make sure to sign up for my newsletter to stay updated on new recipes & giveaway. Sign up for the newsletter by clicking here. Disclaimer: American Kitchen is a paying sponsor of Cooking with Books and has compensated my time to develop these recipes and posts. Thank you for supporting brands that make this blog happen! This is such a pretty and tasty-sounding soup!! This is exactly what I want to eat once it cools down. Heading over to check out that recipe now! Anything Thai! Looks delicious…and yay for soup season! Oh YES. this soup sounds so warm and comforting! Honey Apricot Pound Cakes & Honey Ridge Farms Giveaway! What does a Master Chocolatier do?